Additional Info: Where Hans Christian Anderson wrote his famous stories. Magnificent beaches line the coastline. Hills, forests, lakes and streams, and scenery that changes with the seasons. Denmark is an excellent country for cycling as there are cycling lanes both in the countryside and in the cities. Denmark is quite flat, but can be windy, cold or wet on a bike. Bikes are generally allowed on trains (separate ticket is needed). The Baltic Sea Route - Running 500 miles, always in close proximity to the sea, this route of well laid-out cycle lanes runs through a mosaic of blue fjords, bays, green headlands, islands and peninsulas. Along the landscapes of the Little Belt Fjord, one breathtaking view unfolds after another. Between the islands of the South Funen archipelago, the little ferries will give you a welcome breather. The route has been planned so it is ideal to cycle from town to town, so you can always be sure of a varied choice of places to eat and stay at the end of the day's ride. Sights, attractions and uncountable cultural events await you in the charming coastal towns. The Limfjord Route - A shallow sound that separates the island of Vendsyssel-Thy from the rest of Jutland Peninsula and Denmark's largest fjord - characterized by its many tiny islands, its picturesque midget ferries and its multitude of bridges connecting the various provinces. This is a 440km (275 mile) ride through a diverse variety of nature scenes. From the outstretched, flat country on the northern banks - where only a few hill island come into view - to the gently rolling countryside on the southern banks with its wooded hills, stately manor houses and monasteries - not forgetting the many regional museums, which tell the tale of the fjord and its people. Your pedals will take you back through 7,000 years of Danish history to the Stone Age. Between Aggersund and Hvalpsund at any rate you will pass through the Ertebolle Culture in western Himmerland, sheltered by coastal cliffs from the Stone Age, on top of crunching kitchen middens. When visiting Copenhagen, hire a free City Bike which you can get from special stands that take a small, refundable deposit from an electronic dispenser for 20 krone (about US$3.70 in 2007), redeemable on return. The bikes are mostly slow and without gears, but are ideal for navigating the bike-friendly central area. The rivers, lakes, coastline and sea around Denmark are alive and kicking with fish of all kinds. 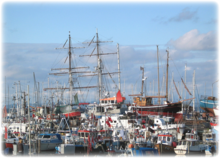 For saltwater (sea) fishing, head down to any Danish harbor and you will find fishing boats that will take you out to sea for a reasonable charge. Large groups can charter a boat for themselves. In East Jutland, there is access to quality saltwater and freshwater fishing. The River Guden, on the Jutland peninsula, is Denmark's longest river and offers great fishing for salmon as well as sea trout. 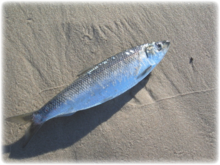 For sea angling, head down to the coast line for excellent shoreline fishing for silvery sea trout - almost year round. In the summer months the wide open beaches of Djursland and the Bay of Aarhus are the most productive. 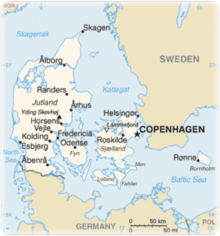 Silkeborg is located in mid-eastern Jutland. The surrounding locations of Silkeborg are regarded among the most beautiful places in Denmark. The landscape is dominated by big lakes, forests and some of the highest points in Denmark, including Himmelbjerget. Here you can choose between fishing larger or smaller lakes for a variety of fish like pike, perch, pikeperch, bream, roach and a host of other freshwater fishes.